Baking has always been something I’ve been pretty good at. 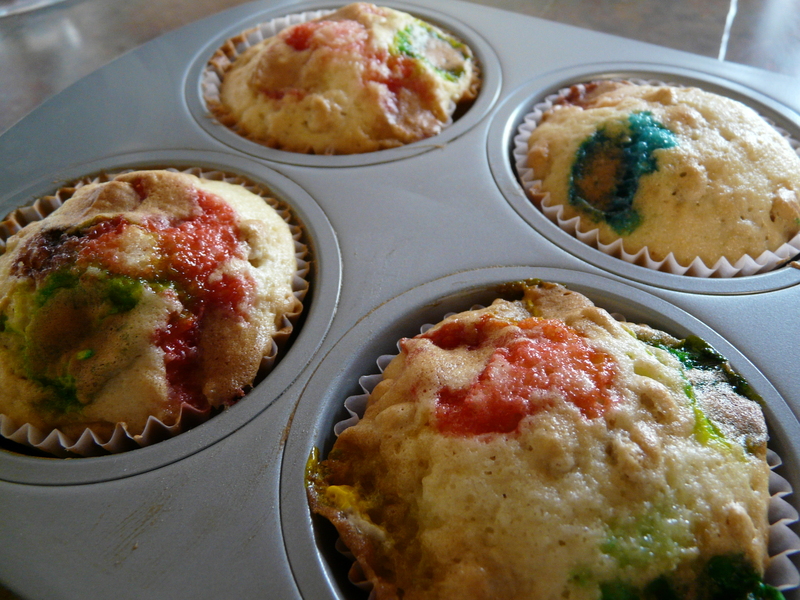 Not to toot my own horn, but I can make some yummy baked goods (making them look pretty, however, is a different story). I haven’t been doing much baking lately because when I do bake all my willpower goes out the window and I will indulge in a cupcake (or two or three…but more like 6! )…and why is it that my Hubby will say he’s hungry for cake and then when I make one, he eats two pieces and never touches it again! Which then presents me with only two options 1) throw it away or 2) eat it myself (can’t freeze it because it just doesn’t taste the same)! Most recipes for cakes, cookies, cupcakes, etc. are just way too much for my small family of two. I was always scared to try to scale recipes down since baking is so much more technical than other types of cooking. Eventually, though, I did start “halving” my recipes, but still this was too much of a good thing for only two people. So, I started going even further with my calculations and scaled back to make just enough for two. I’ve never been great at math, nor have I ever liked doing it. So, I cringe when I break out the pencil and the calculator to start making the conversions, but am filled with satisfaction when I’ve done it correctly! So that’s what I did yesterday. 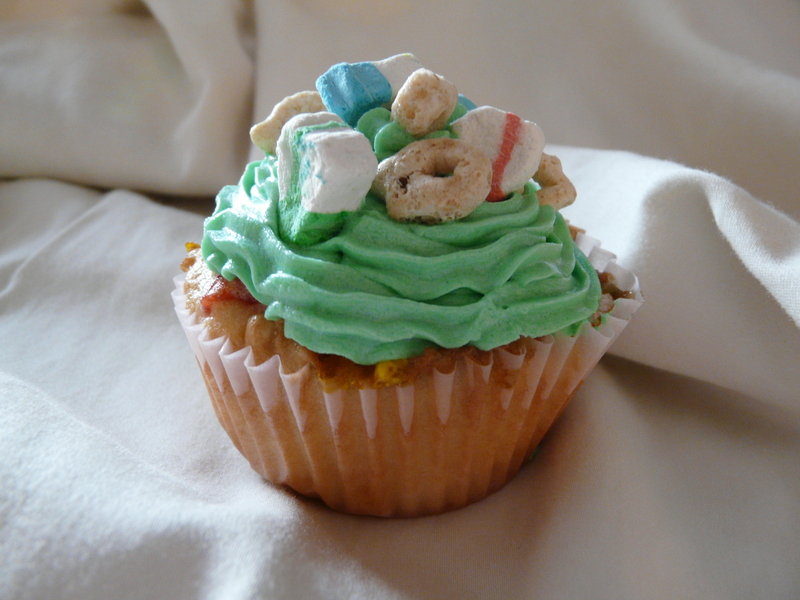 Even though I am not Irish and typically don’t do anything to observe St. Patrick’s Day, I kept seeing recipes for Lucky Charms cupcakes, and I thought I would try them out. I really didn’t find any recipes on the web that were all that special so I ended up using “The Ultimate Vanilla Cupcake” recipe on the “Cupcake Project” website. I considered following the recipe exactly and using real vanilla beans, but it just seemed like a waste of money since I was going to be adding Lucky Charms cereal and didn’t really know how it would turn out. I scaled down the recipe to make only four cupcakes. To me, baking is pretty straight forward if you can read and follow directions. If you are not someone who bakes a lot make sure you follow the recipe exactly and follow the directions the way they are written. Be careful not to overmix your badder. When baking, be sure not to over bake or your end product will be dry. For the frosting, I used the recipe recommended on the Cupcake Project site. I again scaled this down to 4 servings and did not use real vanilla beans. 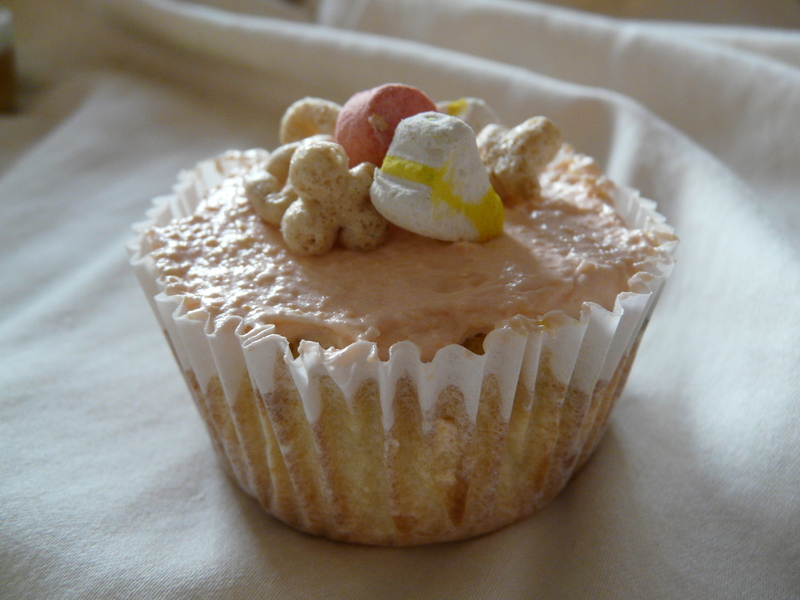 Don’t worry….my willpower held strong yesterday and I only made these beauties for my Hubby. One last tip…something that I didn’t come across when looking for the Lucky Charms recipe, but wish someone would have mentioned…would be to add the Lucky Charms that are on top right before serving. After I frosted the cupcakes I added the Lucky Charms to the top and by the time we finished dinner and were ready for the cupcakes, the cereal had turned stale and this definitely took something away from the overall taste. I hope you enjoy them…even though St. Patty’s Day is over, Lucky Charms are great any day of the year so give them a try!! Preheat oven to 350 degrees. 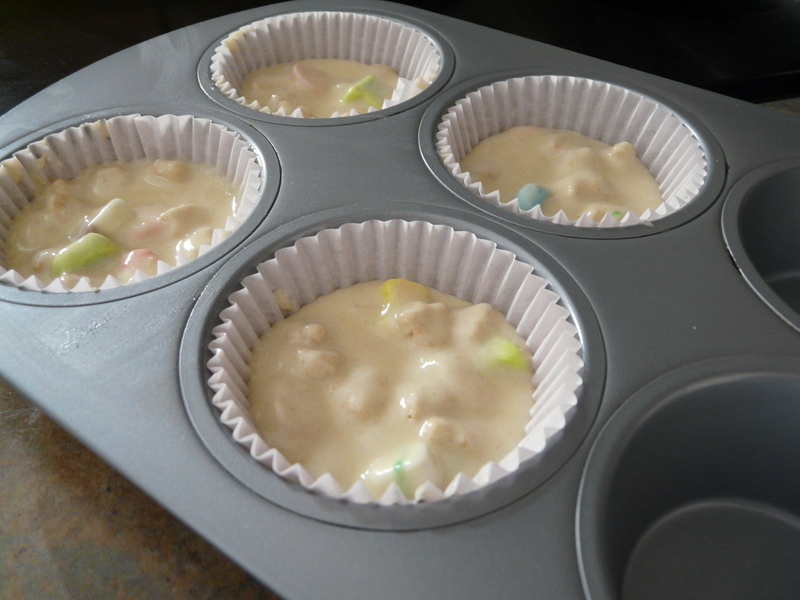 Line a cupcake pan with 4 cupcake liners and set aside. 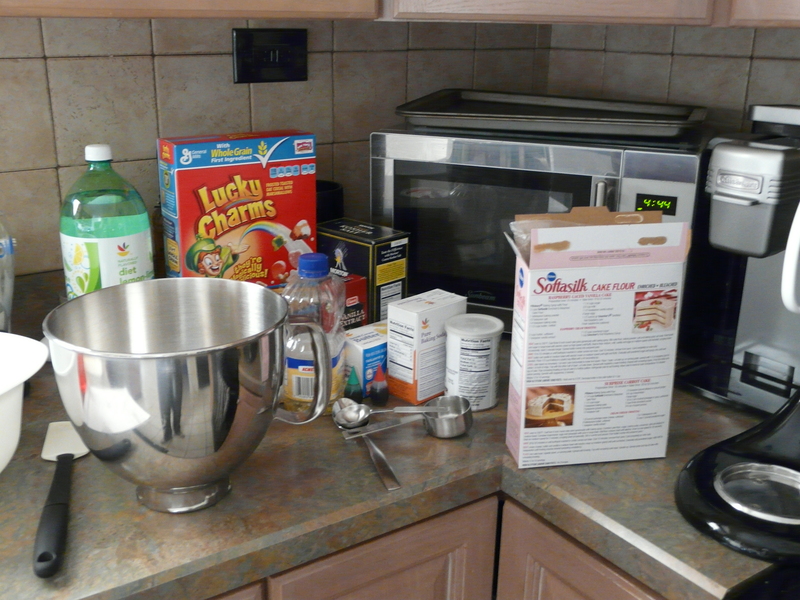 In a large mixing bowl, combine the dry ingredients (sugar, flour, baking powder, baking soda & salt). Add the butter and beat with a mixer for about 3 minutes. You should end up with a fine crumb like consistency. In a separate small mixing bowl, combine the sour cream, egg, vegetable oil, and vanilla extract. Add this to this to the flour mixture and beat until just combined. Slowly add the milk, mixing on low speed until just combined. Fold in the Lucky Charms cereal. Fill cupcake liners about half full. Bake in the preheated oven for 14 minutes, or until a toothpick inserted into the middle comes out clean. 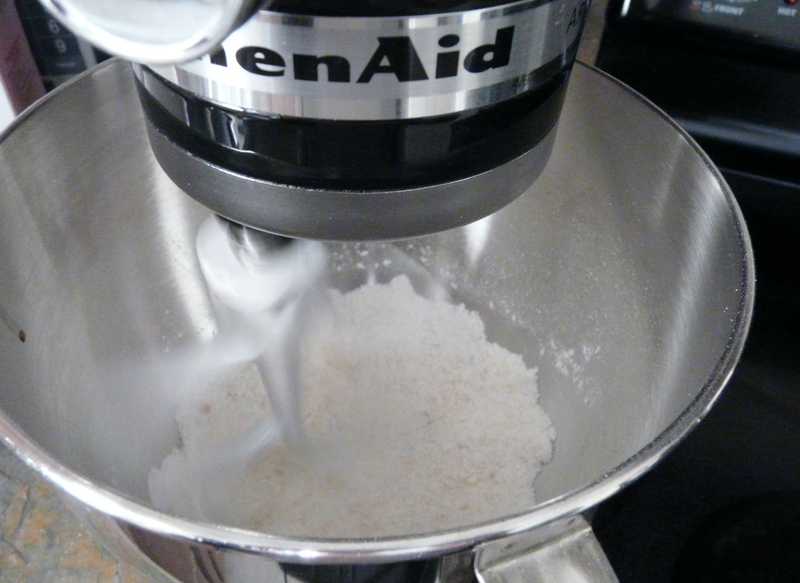 In a mixer, combine the powdered sugar, butter and vanilla extract. Mix on medium speed until smooth. Add the milk and mix until desired consistency is reached. Add more sugar or milk to adjust the consistency. 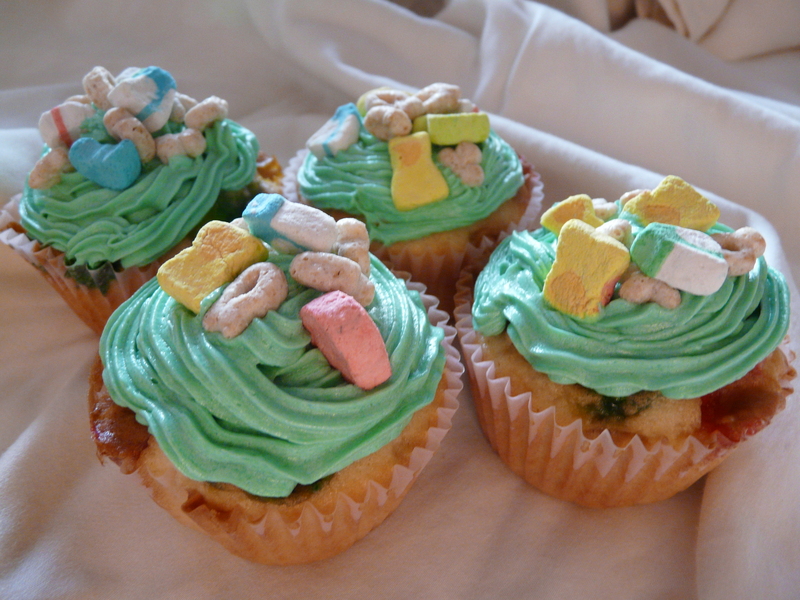 Add 2-4 drops of food coloring (green for the Lucky Charms cupcakes) and mix until combined and frosting is green.